Part 1 – Did NASA Try to Stop Spielberg’s “Close Encounters of the Third Kind” Movie? 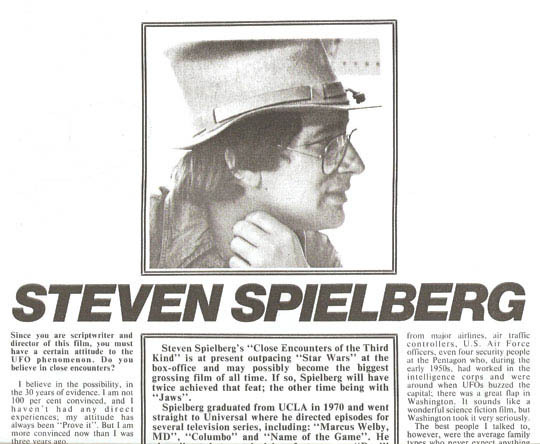 Out-of-print Cinema Papers © 1978 interview with Steven Spielberg, discovered by author Matthew Alford while researching the history of Hollywood cinema. August 26, 2010 Bristol, England - Two British authors, Matthew Alford, 32, and Robbie Graham, 29, are investigating the concept that the CIA and other American intelligence agencies manipulate Hollywood to produce television and movies that can alter public perceptions and be used to monitor public reactions. Robbie is a full-time doctoral candidate at the University of Bristol working on a Ph.D. to examine Hollywood's historical representation of UFOs and potential extraterrestrial life. Robbie formerly was Associate Lecturer in Media at Stafford College in Stafford, England. Previous PostPrevious Part 2 – Hollywood Hit Squad?